OK, After running around the office a bit, asking questions I have got some answers for you. 1) You should not need impulse at at all to purchase the Marathon Theme. All the master skins use a separate store and architecture. When you purchase the suite you should receive a email with a download link. That should be all you need to get the full pack. 2) I have been told there is a Giant �Get Impulse� button on the bottom of the final �Purchase� screen. This is just for marketing, we would like you to have impulse, but it is not required, our used at all for acquiring the Icon suite. 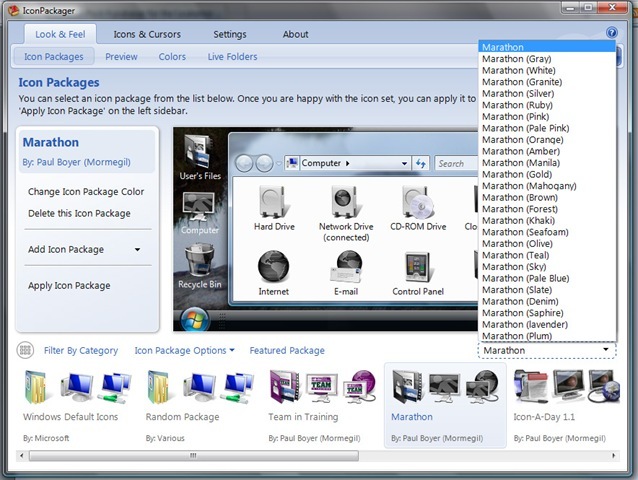 3) If you don�t have Impulse installed, or you want to update �IconPackanger� you will need impulse. If you own Iconpackager it should just be there to run. You might want to update it so that the �Subpack� instillation goes smoothly. If you own Iconpackager, and it is not showing up in Impulse this is a problem, but unrelated to the Icon Packs. And you should contact support. 4) If you do not have Iconpackager at all you can download it from the link I provided above, or from the trial tab in Impulse. I hope this helps. I am sorry you have run into trouble with this. The one of the reasons I released this as a master skin was to keep the purchase process as simple as possible. PS. I asked about Appogee, and it is currently being update to Appogee 2.0, (finally and should be downloadable from Impulse shortly. Updated with more colors and all the Vista Icons. I'd be honored donating to such a worthy cause and getting such an incredible icon package in return is just a huge bonus. This is obviously something near and dear to your heart as can be seen from the effort and quality put into this package. � PS. I hope you had a great run yesterday! I have just purchased it - not just because they are stunning icons, but also simply to support your cause! I nice icon package but I thought I was getting a set of icons in different color schemes. This appears not to be the case. They are just black icons. The only way I found to change the color scheme is within Iconpackager and that just changes the tint of the icons. Not what I was expectiong. I have deleted the package. john wharton, would you by chance be running vista 64 as your operating system? Yes I am running Vista 64. Sorry about the miss post, my iphone dose not seam to like the commenting tool. The ods are that you need to update Iconpackager to the latest version. Older version do not know how to un zip the Subpacks correctly. Sub packs in action. You might need to re-install the package after you update IP, to make sure it installs correctly, if it dose not, you can just change the .IP to .ZIP, un compress the suite, and drop all the folders from the resulting Marathon Folder into your C:\Users\Public\Documents\Stardock\IconPackager folder. This should work with any version above 3. Thanks for the recommendation. I did have the latest version installed. Even tried uninstalling and reinstalling Iconpackager. Same problem. I have the Apogee icon package which has different colors. Seeing how the folders were created for Apogee, I created Marathon folders for each color and copied each group into its respective folder. It works now but I do not know why it won't create the subfolders when the package is installed. Interesting enough the Apogee package does create its folders when installed so I'm not sure why Marathon is doing this. Anyway it's working now. Perhaps just a quirk with Vista 64. Thanks again. Loving these icons to pieces. Top job, Paul, as always! i communicated with a stardock tech support person Thursday or Friday in the #stardock irc channel concerning this issue, Mr Wharton. it seems it is a vista 64 issue and the powers that be are looking into it. there's been no "official" word on it yet ( i didn't want to bother them again so soon) but i wouldn't be surprised if the issue is corrected in the next few days. ----update---- I just tried what Paul suggested. Renaming the .ip file to .zip and extracting the files into the individual folders given in the paths for the files has installed each one of the subpackages on Vista64. I highly recommend that procedure. Finally got it. Well done. Thank you very much for your help! I learned something new about renaming a .ip file to .zip. That worked very well! I figured the problem was related to my using Vista 64 and am glad that I mentioned the problem here. Again thanks for being so helpful! I will really enjoy using this set of icons. Really cool pack and great initiative. I am sorry to here you are having problems downloading the pack. Unfortunately this is the largest Master skin done to date, so we had to put it on the servers with our Digital Content from Impulse. And impulse is being hammered at the moment downloading 1000ish copies of Demigod a day, at 2.4gigs each. This seams to be leaving little room for the poor Marathon Icon Suite. The good news is the problem should right itself soon as the early sales of Demigod leval out. I was wondering why sales had almost flat lined since tues day, this gave me the clue to fiqure it out. I dont know, if it dose just email me. Mormegil@stardock.com and I will make sure you get taken care of. Once again sorry about the problems. Sadly that part of things is out of my hands.